The former secretary of state, first lady and U.S. senator talked about public service and higher purpose in the ceremony honoring her with the inaugural award. 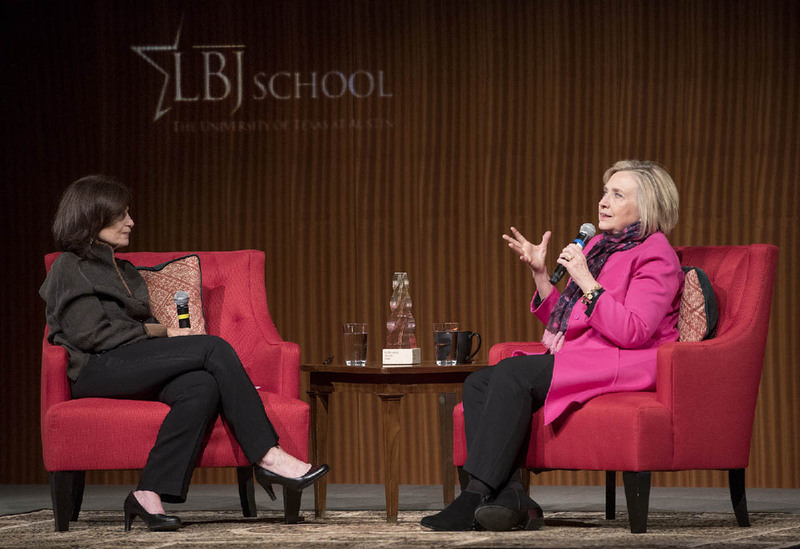 AUSTIN, Texas, Nov. 14, 2018 — Hillary Rodham Clinton accepted the LBJ School of Public Affairs' inaugural In the Arena award, honoring her lifetime in public service, before a full house in the Lady Bird Johnson Auditorium on Tuesday. During a wide-ranging conversation about purpose and perseverance with LBJ School Dean Angela Evans, Clinton reflected on what it's like in the arena of public life and how you keep going in the face of tough odds and setbacks as well as victories. "If you're in the arena, you can't, in my experience, be there just for your own gratification," Clinton said. "If you're not there on behalf of a cause larger than yourself, and you face a setback, it's hard to keep going." In her introduction, Evans said Clinton's life as an attorney, advocate, first lady, U.S. senator, secretary of state and presidential candidate "perfectly captures the spirit of Teddy Roosevelt's speech in Paris more than a century ago" — the "The Man In The Arena" speech that inspired the award. Roosevelt said: "The credit belongs to the man who is actually in the arena…; who spends himself in a worthy cause; who at the best knows in the end the triumph of high achievement, and who at the worst, if he fails, at least fails while daring greatly, so that his place shall never be with those cold and timid souls, who neither know victory nor defeat." "If you want to be blameless, stay on the sidelines," Evans said. "If you want to make a difference, you have to be daring enough to get into the arena." Clinton, who talked about her efforts to assist female candidates, said she was encouraged by the outcome of the midterm election — particularly the number of women running for office for the first time. "The diversity was not just diversity in race or in background," Clinton said. "It was a diversity that really showed you the full range of who we are as Americans and I can’t wait to see a picture of Congress." Asked about LBJ School alumna Stacey Abrams (MPAff '98), the Democratic candidate for governor of Georgia, whose race at this writing remains undecided, Clinton responded, "If she had a fair election, she already would have won." Clinton talked about the issues she worked on as a young activist, and also discussed the role that universities play in preparing students to do the work of seeking information, fighting for the public good across the political spectrum. She mentioned working with former Sen. John McCain (R-Ariz.), who she described as the embodiment of the kind of leader who loved to learn from people, especially those whose opinions differed from his own. Prior to the Tuesday evening ceremony, LBJ students had a private session with Secretary Clinton. They discussed passion, politics and a career in public service. Had the opportunity to hear from @hillaryclinton today, as well as from President Lyndon Johnson’s daughter, Lynda Johnson Robb. Thank you @thelbjschool and @lbjlibrarynow for hosting such a great event! "Leadership is earned by the hard work of not only preparing and studying and trying to figure out what you would do if you got into leadership," she said. "But it's constantly earned by expanding your horizons — not shutting down, but opening up. "For me, that's one of the real threats that we've got right now — people think that somehow leadership is joining a team and never talking to anybody on the other team, going into your corner and never coming out," Clinton said. "Leadership is earned in many different ways. … I think you have to keep trying to become a better leader, to become a more empathetic leader, to become a more accomplished leader. And that's hard work. It doesn't just happen because you hope for it to happen; it's because you really are determined to achieve it." Student engagement was central to the planning, development and execution of the award. Graduate students from the LBJ School, representing the next generation of public leaders, met with Secretary Clinton privately in advance of the ceremony. Students at UT's Radio-Television-Film department at the Moody College of Communication, under the direction of Professor Paul Stekler, collaborated with the Austin-based ad agency GSD&M to develop a multimedia tribute to Secretary Clinton. And students from UT's School of Design and Creative Technology at the College of Fine Arts, under the guidance of Professor Jiwon Park, designed the In The Arena physical award presented to Secretary Clinton. Over the course of several months, students in wkrm design studio worked to conceptualize this award to recognize men and women who have dedicated their lives to public service. They identified values that represented the meaning of the award, and researched, developed ideas, and created prototypes using a variety of materials and processes. "A Burning Torch" by Jenna Ma, Michael Johnston, Jr. and Nader Sadoughi was selected as the final design, symbolizing enlightenment, hope and truth, and blazing with perseverance and patience.